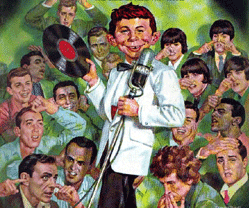 When I was in elementary school, my next door buddy Arthur Cothary and I got our hands on a copy of MAD magazine featuring “Alfred E. Newman Vocalizes.” Inside was a 33⅓ rpm recording titled It’s a Gas. We put it on the turntable and sat back. At Alfred’s first burp, Arthur and I were rolling on the floor in stitches. By the third burp we were laughing so hard we couldn’t breath. This morning your First Nerve host and narrator was live in-studio at WNYC on the Leonard Lopate Show, talking about smell. You can cue it up right here and listen to a blogger vocalize.